During the first two or three years of his ministry in Jeffersonville, Brother Branham was holding Sunday morning services in a rented hall. In 1933, Jeffersonville was, like the rest of the Nation, in the grips of the Great Depression. And to the natural mind it seemed like an act of folly for such a small, poor congregation to attempt to build a church. Had it not been for the peculiar ministry of the man they called their 'Pastor', perhaps this poor congregation would have thought the same way. But the Lord had already shown this young pastor the 'corner property' he was to build on. The Lord showed him that he was to build a Tabernacle on the "corner" of Eighth and Penn Street in Jeffersonville, Indiana. A 'corner' it would be indeed! Here not only two streets met but 'two ways' would meet head-on - God's way versus man's way; the Word of God versus Tradition would clash. On this corner, a line would be drawn in the Word, separating Truth from error. For an End-time generation the building of this Tabernacle would represent a Junction in Time. From here God would manifest Himself and reveal a Message that would change despensations, close out the Pentecostal Feast, bring in a Bride Age, announce the Second Coming of Christ, declare the Day of Vengenance of our God and usher in the Millenium. Not even the least bit aware of the magnitude of what God would achieve on the 'corner' of Eighth and Penn streets, the small, poor congregation started a Building Fund. God blessed them and within a short time (March 1933) the foundation for the Tabernacle was laid. 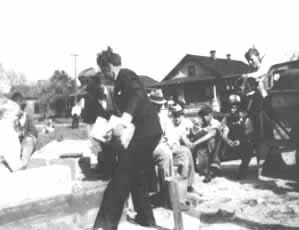 On a sunny day in March the little flock gathered to watch as their young Pastor literally laid the Cornerstone to the building. Curious onlookers stood at a distance, no doubt contemplating the 'folly' of such a small group attempting to build a church. Some pointed the finger and said, "Holy roller!" When the Cornerstone was laid many prophesied that it would become a garage within six months. Finishing the writing, he tore the 'flyleaf' from his Bible, bending down, he placed it inside the Cornerstone. No doubt the onlookers felt that this was a nice spiritual gesture on Brother Branham's part. Perhaps the Prophet himself never realized the full significance of what he was doing. But about thirty years later he would refer back to this event and the Scripture inside the Stone. In placing the last dab of morter around the Stone, God's Servant had put into place the Cornerstone, not only for Branham Tabernacle but it would also become, in type, the Cornerstone of a revival that would sweep around the world. BUT inside that Stone, written on the 'flyleaf' of a Prophet's Bible, was a Prophecy that the Cornerstone would be rejected. The Scripture inside the Stone instructed the Prophet to "Preach the Word, Reprove, Rebuke, and Exhort...Do the Work of an Evangelist and make full proof of his ministry", because the day would come when the people would not endure sound doctrine. God would hold him responsible to deliver A Messsage to an End-time generation. In another turning point in his life God would give His Servant "Two Signs" which, when manifested, would draw the attention of the people to "The Message" he was ordained to bring. This little 'hillbilly' preacher would be used of God in a mighty way. He was ushered into the chambers of Royality, the halls of the Mighty and into the huts of the poorest of the poor. The construction of the little Tabernacle was completed in September of 1933. And for many years it was 'home base' for God's End-time Prophet. Marvelous are the works that have been done in this building; But even more marvelous is the Revelation of the Word of God which come forth over it's pulpit. For a history of the Branham Tabernacle I suggest you follow the link to The Lily Pond Church. It's been about thirty-two years ago, here in Jeffersonville at Eighth and Penn Street, the morning when I laid the cornerstone on this Tabernacle... That the Lord Jesus woke me up the morning that the cornerstone was to be laid, about early, about six o'clock. And I had been lying in bed for some time, with my heart full of joy, thinking of this great time that the Lord God was going to give me a tabernacle to preach in. I was merely a young boy then. And I remember that morning when I had wakened up, and laying in the room, the upstairs right here on Seventh Street. Something said, "Rise up to your feet." And I got up. And I saw, as it was, a great place, and It was like a place where there was a river run in the valley. And I got down there to the river and I understood it was a place where John the Baptist had been baptizing the people, and they had turned it into a hog lot. And I was very critical of it, just saying that this should not be done. And while I was there, there was a Voice spoke to me and took me up, and I noticed the Tabernacle in just about the state it's in right now. But there were so many people till they were just packed all in the Tabernacle, in this condition, about the state it's at now. And I was happy, standing behind the pulpit, saying, "God, how good You are to give me a Tabernacle." And at that time, the Angel of the Lord spoke to me, and said, "But this is not your Tabernacle." And I said, "Then, Lord, where is my Tabernacle?" And He taken me up in the Spirit again, and set me down in a grove. And way down the grove was just rows of trees setting just level, about twenty-feet tall, or thirty. And they looked like fruit trees, and they were in great big green buckets. And then I noticed to my right hand and to my left hand, there was an empty bucket on either side, and I said, "What about these?" And He said, "You're to plant in them." So I pulled a limb from the tree to my right and placed it in a bucket on the right side, and a limb from the left hand and place it in a bucket on the left side. Quickly they growed all the way into the skies. And He said, "Hold out your hands and gather the fruit thereof." And in one hand fell a great yellow apple, mellow and ripe. And in the other hand fell a great yellow plum, mellow and ripe. And said, "Eat the fruit thereof, because it's pleasant." And I ate from one and from the other, very delicious. And just then I held up my hands, and was shouting the glory of God. And all of a sudden, that Pillar of Fire came down over the top of those trees, and the roar and the lightnings flashed, and the winds blew real hard, and the leaves begin to blowing from the trees. And I looked way down, here stood the shape of this Tabernacle, the way it sets now. And at the end where the pulpit would be, there were three trees, and those three trees taken shape of three crosses. And I noticed that both plums and apples were gathered in a clusters around the middle cross. And I ran real fast, screaming to the top of my voice, and fell down by the cross, and threw my arms around it. And the winds begin to shake, and the--the fruit from the cross, and it fell all over me. And I was so happy, just rejoicing. And said, "Eat the fruit thereof, because it's pleasant." And then just a circling of Fire, called out, said, "The harvest is ripe, and the laborers are few." And He said, "Now, when you come to yourself again, or come out of this, read II Timothy 4." And then I came to myself. And I stood there rubbing my face and my hand. And just then, in the corner of the room, sun shining high, then I must have been under the vision for some hour or more, and It said, "II Timothy 4." And I reached quickly for my Bible, and read II Timothy 4. But today the people don't want to hear that, they want to be tickled in their ears. Exactly what the Holy Spirit told me the day I laid that cornerstone there, said to, "Preach the Word; be instant in season, out of season, for the time will come when they will not endure sound doctrine; but after their own lusts shall heap for themselves together teachers, having itching ears, and shall be turned from the Truth to fables."